It must have more than 4 valves. 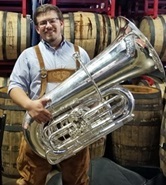 I'm fairly new to the larger CC tubas, but thus far I have tried out a PT-6, MrP, Wessex Chicago York, and a Miraphone 1293. I really liked all of the tubas that I've tried so far. The MrP and the Miraphone had stellar free-blowing characteristics. The Wessex and the PT-6 that I played had outstanding intonation. I'd prefer not to travel more than 200 miles from Chicago to try out a horn but I'm a fairly flexible human. Thanks in advance. Matt Gaunt has (had?) an MRP, and he is in Chicago. My budget is anywhere from 6-10K and I'm looking to buy some time before the fall. If you are willing to compromise on your piston stipulation and distance, then I've got a stonkingly good PT-6 for sale in th eUK. Ola, while I loved the Mr P I played, I'd really need to be able to drive some reasonable distance and spend a fair amount of time putting it through its paces before making a purchase of this magnitude. Also, I do heavily prefer pistons. Awegner2 wrote: Ola, while I loved the Mr P I played, I'd really need to be able to drive some reasonable distance and spend a fair amount of time putting it through its paces before making a purchase of this magnitude. Also, I do heavily prefer pistons. Bort, thanks for the post. Something to consider. I see your ribbon has a PT-7 (soon) in it. How familiar are you with that horn and how does it compare to something like a PT-6p?